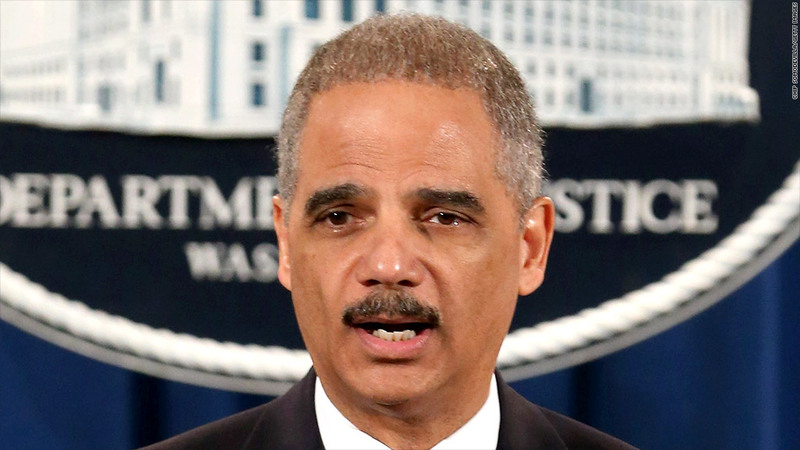 Standard & Poor's says Attorney General Eric Holder's Justice Department is suing the agency because it downgraded the U.S. in 2011. Standard & Poor's is arguing in a court filing that it is being sued by the Justice Department in retaliation for the firm's downgrade of the U.S. government's credit rating two years ago. In February, the Justice Department filed a suit against S&P seeking $5 billion in fines related to its ratings of bonds backed by subprime mortgages ahead of the financial crisis. It argued that S&P gave deceptive ratings to the mortgage securities between 2004 and 2007 in order to collect fees from the firms that were pooling the risky home loans into securities. In a filing in federal district court on Tuesday, lawyers for S&P parent company McGraw Hill (MHFI) charged that the suit was simply retaliation for August 2011 downgrade in the U.S. credit rating from AAA for the first time in its history. It points out that it is the only credit rating agency to be sued, even though rival firms such as Moody's (MCO) and Fitch also gave ratings to mortgage bonds that later failed. "Only S&P Ratings downgraded the United States and only S&P Ratings has been sued by the United States, even though the S&P ratings challenged by the United States were no different than those of at least one other rating agency," said the firm's lawyers in the filing. It said the First Amendment free speech protections make the government's action unconstitutional as well as "impermissibly selective, punitive and meritless litigation." At a news conference at the time the suit was filed, Justice Department officials denied there was any connection between S&P's downgrade and the suit being filed. They said the probe into S&P's ratings on subprime mortgages started in 2009. They would not comment at the time whether any other credit agency faced similar legal action. The failure of securities backed by subprime mortgages was a major factor in the near collapse of the global financial system in 2009. S&P and other agencies gave the mortgage bonds some of their top credit ratings, suggesting there was little risk that home borrowers would default on the loans. But when the housing bubble burst and home prices fell sharply, foreclosures soared, causing widespread defaults on the bonds and problems for the financial institutions, such as Lehman Brothers, that held the securities. S&P's downgrade of the U.S. credit rating came in August 2011, with the agency arguing that partisan gridlock between Congress and the Obama administration made it difficult to reach an agreement on the needed debt reduction.